Early mornings. School runs. New friends, new teachers and a ton of stories on the way home every day. New bags, books and stationary that are so interesting at least for now 🙂 New challenges to meet, worries to calm, failures and successes, friends and enemies, heartbreaks and triumphs. A new school year. 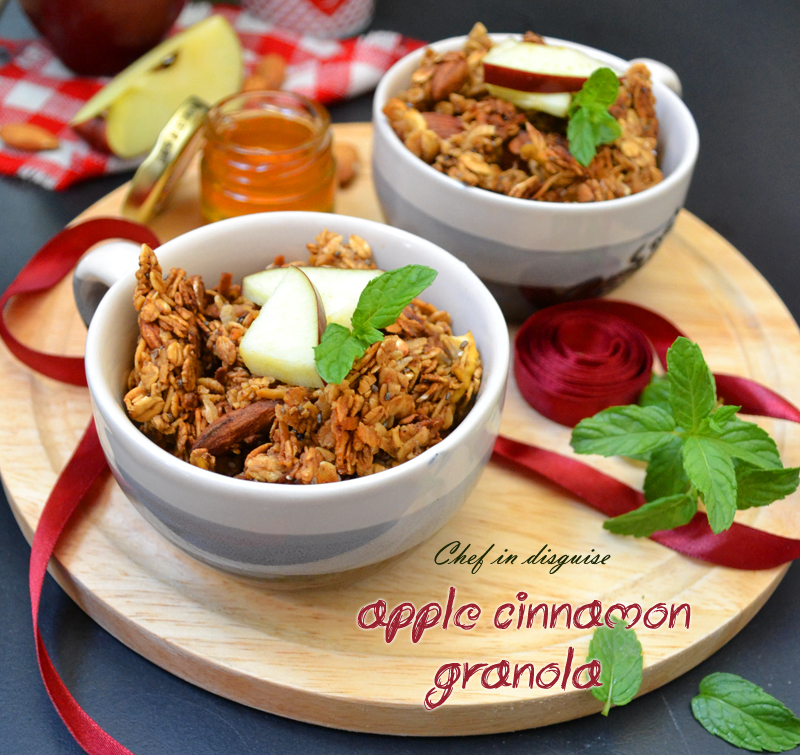 We’ll start with my kids’ favorite granola, apple oatmeal granola. I love making granola at home! it is super easy, no preservatives or additives to worry about, costs a fraction of what you would pay to buy granola at the store and the best part is, the flavor combinations and possibilities to try are endless! I make so many different types of granola and was surprised to realize that I have only shared two on the blog. One that is gluten free and another with apple sauce and date puree . 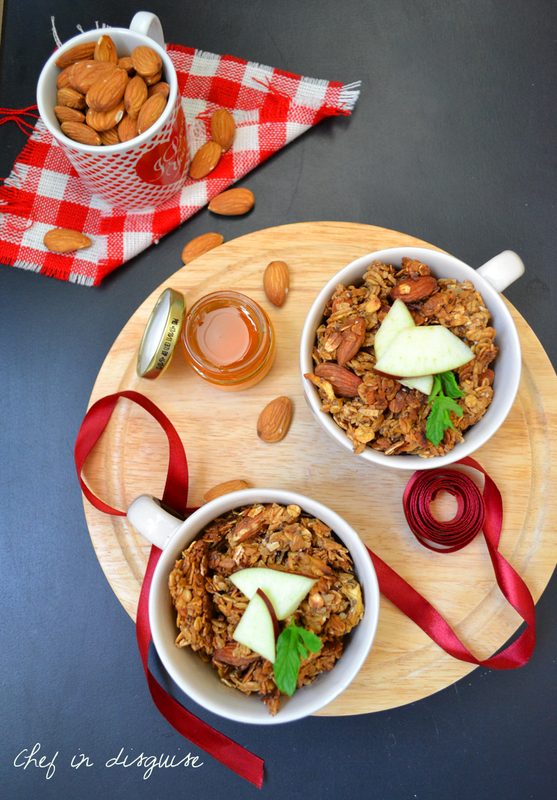 To correct that there are a few more granola recipes coming your way in this series, a chocolate hazelnut granola, seed enriched granola and carrot cake granola 🙂 so if you are looking for inspiration with your breakfast oatmeal do stay tuned. If you like the granola to be more crunchy, turn the oven again to 180 for 10 minutes and turn it off and leave the granola in the oven till it cools down. Posted in Back to school, Breakfast, lunch box ideas, vegan, Vegetarian and tagged apple cinnamon, back to school recipes, breakfast ideas, Granola, granola recipes, homemade, homemade yogurt, lunch boxes, make ahead breakfast, new school year, rolled oats, toasted oatmeal. Bookmark the permalink. I love when you do these types of series, and granola is particularly interesting to me, as Phil likes to start his day with granola and milk…. I’d like to use these ingredients to make granola bars that I can throw into my lunch bag. I’ve got whole almonds, pecan halves and walnuts in my freezer and shredded coconut in my pantry. Maybe sesame seeds instead of chia seeds as I want to use up what I’ve already got. The series is a great idea! 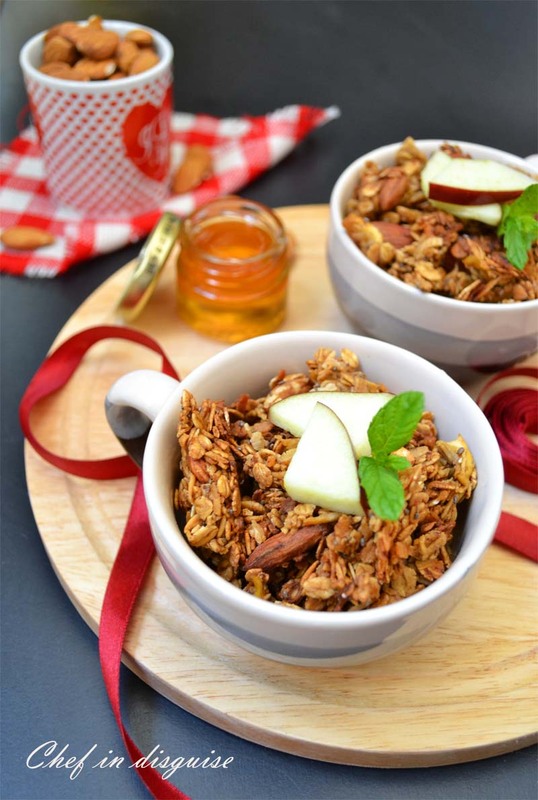 And the granola look wonderful – who doesn’t like granola. I love cinnamon, so this is perfect for me. Thanks! Since I have nobody in school any more (sad face) I eat it all myself. I bring up a small bowl to my office and when I’m craving a snack… I don’t reach for a cookie. Although I don’t know that this is much different calorie-wise. Yours is different from mine, so I’ll give yours a go. Looks very pretty in those photos. 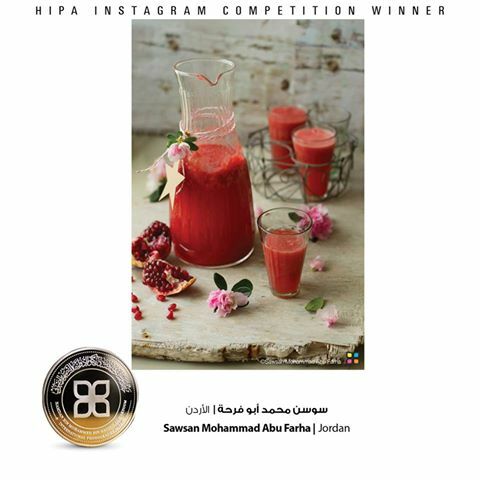 The granola looks absolutely lovely! I love the apple and cinnamon combination too! Another one of your magnificent creations sister i like your blog and happy jumma to you and please don’t forget me in your prayers after namaz..